"It's a little ridiculous to think of the incredible impact that Kalev, and specifically Evelyn Koop, has had on my life. Being able to be a part of a team of strong, independent, and dedicated young women from such a young age definitely elevated my sense of self and overall life potential. The drive and passion I was exposed to through being a member of Kalev at the World Championships inspired me in countless ways and the focus and relentless work ethic they instilled in me absolutely played a huge role in making me who I am today." "Kalev has opened up a world of opportunities for me , from gymnastics to personal development to my modelling career. Over the year Kalev and Mrs Koop in particular has become like a family to me." "Our team at Kalev was like a family. There would be change year after year but no matter what we gymnasts, the coaches, and Mrs. Koop would always be a tight-knit group. Kalev brought everyone together and gave me experiences that can never be matched. I still smile when I think about the times we all laughed through tough trainings, the amazing trips we got to take, and the opportunity to represent Canada at the World Championships. I'll always be thankful for the incredible and irreplaceable memories and lifelong friendships Kalev brought to my life." "It was always so inspiring to see that one woman was able to inflict such power and direction for the Rhythmic Gymnastics movement in Canada. Evelyn Koop is an incredibly passionate and driven individual and her work is the very essence of the development of RG and AGG in Canada. Furthermore, miss Koop holds a special place in my heart for always supporting me and for believing I could make it to the very highest level of competition, since the very beginning of my career." "When I think of what Mrs Koop has accomplished and what she brought to my life, 2 characteristics come to mind: her passion and tenacity that influences a breadth of opportunities. Thanks to her, I've gotten to see more of the world, perform on international stages, and meet some amazing coaches, choreographers and talented gymnasts. I'm proud to say that my first career in RG, AGG and coaching wouldn't have been possible without Mrs Koop." "Mrs. Koop is the sweetest and most unique person I know. She makes me smile and she make me laugh. She always took me in with open arms and I could not be any more thankful." "Mrs. Koop has changed my life by inspiring me to always work hard towards the things I desire. Her hard work is what drove Kalev to become the largest rhythmic gymnastics club in North America. Her dedication is forever inspiring, as well as her never ending love and support is what has helped me succeed. Thank you Vana for always showing me that there is a light at the end of the tunnel." "I saw her [Mrs. Koop] many times! She was actually such a sweet and kind woman. She was also kind of funny and adorable. She helped bring rhythmic gymnastics to Canada. I joined Kalev when I transitioned to national level and it was the coach she hired that discovered me and turned me into an Olympian. Without Mrs. Koop I would of probably never went to the Olympics! She also promoted Canadian rhythmic gymnastics on the international stage. She would spend a lot of money on the Koop Cup competition trying to bring in international gymnasts to compete and would also organize amazing year end shows that the whole club would get to perform at! She hired a woman to create a whole Cats musical with everyone to perform for our parents and put a lot of effort into all of these events. She would even have little events at her house. She loved socializing and she made our club feel like one big family." "My move to Canada as a young girl was exciting. 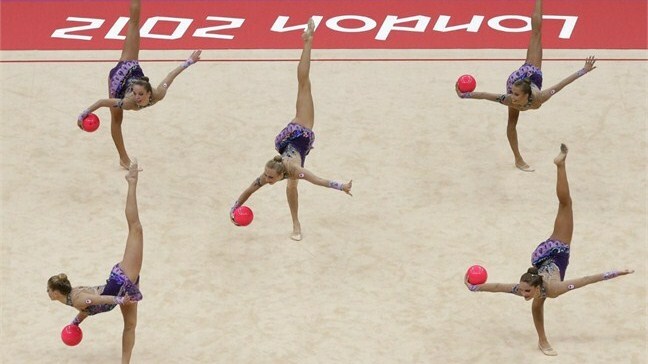 It gave me a chance to be introduced and to be a part of the most beautiful sport - rhythmic gymnastics. When I began to take it seriously, displaying my devotion and love for RG, my family couldn’t have had better support. Evelyn Koop was always there for us, we became closer over the years, and to me she is family. Words cannot describe my gratitude for everything Mrs. Koop has done, not just for me, but for the entire community of rhythmic gymnastics. We have all created friendships that will last a lifetime, memories that we still reminisce, our experiences with our coaches, our travels around the world, achievements we can fall back on, and the dedication and discipline that was instilled into us, which will never compare to an average person." Mrs. Koop’s dedication to her athletes and to the sport of Rhythmic Gymnastics have no doubt impacted thousands of lives worldwide. Personally, I have and always will be impressed by her energy, generosity, and passion. She inspired me to always work hard and live the best possible version of my life, and for that, I must thank you dearly, Mrs. Koop. Over the years Kalev has produced many champions and has had some remarkable performers. Look below to see some of our most successful alumni. Having competed with the Canadian National group since 2009 and in London 2012, Kelsey was an accomplished Canadian Nationalist. 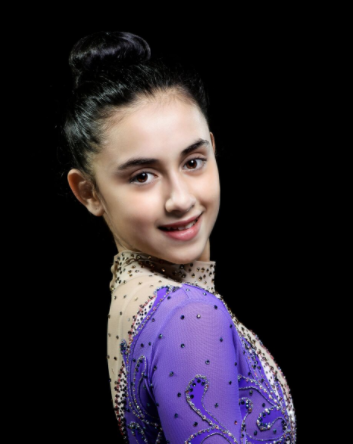 Prior to that, she was a member of the National Junior group. Aleksandra Jurevich began RG at age 11 and two years later became Provincial CHAMPION. She competed nationally and internationally and was a member of the National team in 2001. Anastasia was a mamber of the Junior National team, as well as a member of the Canadian National group. She also competed at the 2012 Olympics! Rosie was a member of our National Team, Team Captain when she competed with the Canadian National group in London 2012, and she was captain of our Olympic team. Mariam was a member of the National team, she was the highest ranked Junior in 2009, and she was the Senior National CHAMPION in 2011. She was also awarded the title of "Athlete of the Year" in 2011. In 2001 Oksana was the National Rope Champion and a Junior Group Champion. 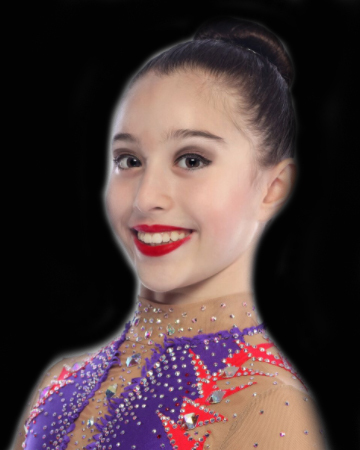 She also competed internationally, at the "Four Continents Championships" in Brazil. Triinu Kimmel is a former Estonian National Team member, she coached for Kalev forsix years and also performed regularly with the "Rhythmic Expressions" as a soloist. She was Head Coach of The Markham Centre, as well. Diana Kwon was a National Team member 2002 - 2004. Among her achievements are: a gold medal in group at the Nationals in 2000, a 10th place at the Koop Cup 2001 and representing Canada at the Deriugina Cup 2002. She joined the Rhythmic Expressions for the 2004-5 season and competed at the AGG Worlds in Denmark 2005, in Spain 2007, in Toronto 2008 and in Bulgaria 2010. She also performed at the FIG Gala of the World Gymnaestrada 2007. In 2011, she competed and performed at the Koop Cup in Toronto. Rachel Cossar was an RG competitor and National Team member for several years. (The following text from Boston Ballet website:) Cossar began her training at the National Ballet School of Canada, the Royal Winnipeg Ballet School, before joining the Boston Ballet School as a trainee. Cossar danced with Boston Ballet II for the 2008 - 2010 seasons before she was promoted to the corps the ballet in 2010. Cossar's Boston Ballet repertoire includes the Nutcracker, Swan Lake and Romeo and Juliet. Katia Zaitseva, Kalev RG gymnast and member of the National Team. She was CHAMPION at the Provincials already as a Novice in 1999, and National Regional Child Champion in 2000. As a Junior in 2003, she was 5th at the Nationals, 2nd in 2004, 3rd in 2005. That year, she got a silver medal at the Junior Pan-Am Games in Brazil, and also competed at the Aeon Cup in Japan. Ekaterina (Katia) Kharlip, former National Team member, both as an individual (7th at Elite Canada and 8th at the Nationals 2007) and in group (silver medal at the Canadian Group Championships 2007. Later, she performed with the Rhythmic Expressions and competed at several World championships. She is an AGG judge and works for Gymnastics Ontario. Emilie Livingston, Kalev's in Sydney 2000, where she represented all of the Americas! The year before, she was the Pan-American CHAMPION. Emilie was also captain of Canada's Senior National Team, which got silver at the Pam-Ams 2003, bronze at Kalamata, Greece in 2003 and placed 12th at the World Championships 2002 in New Orleans and 2003 in Budapest. Emilie was also a member of Kalev's Rhythmic Expressions2004-06, representing Canada at the AGG World Championships 2005 and 2006. Now living in Los Angeles. Videos: #1 and #2. Irina Funtikova, Junior National CHAMPION 1999, second in Canada as a Senior, member of Canada's Senior Group which got silver at the Pam-Ams 2003, bronze at Kalamata, Greece in 2003 and placed 12th at the World Championships 2002 in New Orleans and 2003 in Budapest. Irina was a member of Kalev's Rhythmic Expressions and competed at the AGG Worlds in Bulgaria 2004. She later worked as a model. Talvi Kuld, former RG competitor, winning group silver at the Nationals 1998 and 1999. Former member of the Senior Elite and ofRhythmic Expressions. Competed at AGG Worlds 2001-03 and 2005. Performed at two World Gymnaestradas. Kiiri-El Kuld, Provincial CHAMPION 2003. Carly Orava, Provincial Novice CHAMPION 2000, Junior Group National champion 2001. Also competed internationally: Japan (Aeon Cup) and Brazil (Four Continents). Heli Oder - former National Team member, competing in Norway, Finland, Brazil and Monaco. Heli was a member of the Kalev Estienne Senior Elite and the original "Rhythmic Expressions", performing all over the world, on five continents, participating in four World Gymnaestradas. As a Kalev coach she gave many future competitors (among them Alex Orlando) their start in RG. Now head of Toronto French School's Phys. Ed. department and a member of the Alumnae Elite. Juilee Gondhalekar - Provincial CHAMPION 2000. Coaching for Kalev Estienne for many years. Head coach for York Rhythmics 2004 - 2007. Olga Morosova was the Provincial CHAMPION 2001. Sydney VanDelft was the Novice CHAMPION at Elite Ontario 2000. Provincial Jr. CHAMPION overall and in every apparatus in 1993. Competing at the Nationals as a Senior, she was 5th overall (2nd in ball). She was recruited to "Rhythmic Expressions" at its beginning and was a member of the Canadian FIG Gala Team 1999. She has a B.A. in dance from Ryerson University and was also selected as a cheerleader for the Toronto Phantoms Arena Football Club cheerleading squad and the Jays crew (New Blue Jays Cheerleaders). Now living and working in Norway: Studio Vanessa. Began RSG training at age 6. As a Novice, she won bronze overallat the Provincial Championships. As a Junior, she competed at the Nationals and, as a Senior, at the Florida State Invitational, L. A. Lights, the NHK Japan Invitational and in Cape Town, South Africa. Gloria was a member of the "Rhythmic Expressions" 1997- 2000 and also of Kalev 's FIG Gala Team at the World Gymnaestrada in 1999. Now living in Ottawa. Susanna Wadsten was a Provincial Jr. CHAMPION in 1992 and Sr. group champion 1996. She has coached elite and recreational groups, was a member of the Child, Junior and Senior Elite, and one of the founding members of the "Rhythmic Expressions", Kalev's AGG team. Performed at three World Gymnaestradas. Has a B.A. from Western U and an M. Sc. from King's College, London, UK. Living and working in Germany. Shirra Cremer studied under Katrin Pettinen for many years, became a member of the Sr. Elite, was Senior provincial group CHAMPION 1996 and also performed with the "Rhythmic Expressions", travelling to many parts of Europe. She also coached for Kalev. Graduated as a nurse from Western U.
Camille Martens joined Kalev in 1995 and became the CHAMPION at the Olympic Trials 1996. As an athlete she was the only Canadian to represent the sport at the 1996 Olympics in Atlanta, USA! Melissa Jung was a CHAMPION (gold overall) at Eastern Regionals 1998, competed in Cape Town, South Africa. Alexandra Orlando was Novice CHAMPION, this shot was taken in L. A. Lights 1997. Tamar Krauss - 1995 Novice Provincial CHAMPION (gold in every apparatus as well as overall). NatashaWatkis was a Provincial Novice CHAMPION (gold overall and in all apparatus) 1996. Simone Lazor was the Ontario Sr.CHAMPION (gold overall and in every apparatus) 1995, silver at regional championships 1995 and CHAMPION in hoop, clubs, ball and ribbon. Theresa Fung was a former Junior CHAMPION and National and inter- national competitor, she retired in 1995. Later she studied at York U, majoring in Fine Arts and she is now teaching. Jenni McGuire became British National CHAMPION 1995 while training with Kalev and coach Lusi Dimitrova. Clare McFarquhar was on the National Team 1990-93, silver and bronze at competitions as a junior in the States 1990, on the Canadian Olympic training team in 1992. CHAMPION at Four Continents 1992. Now a teacher. Malene Charles was a Coast-to-Coast and National Jr CHAMPION 1991. Also 1st Jr overall at the Four Continents Trial 1992. On the National Team, individual and group, 1988-95. International competitions included China, NYC and winning team silver in Belgium. Tuulika Mölder was the Estonian National Champion, performed with the Senior Elite and the Rhythmic Expressions. Taimi Petersoo began RG as a child and was a member of the Kalev Junior Elite, Senior Elite, the "Rhythmic Expressions" and the Alumnae Elite. Linda Makk is a long-term member of Kalev, performing with the Junior Elite, Senior Elite, and Alumnae Elite. Monique Romeiko was a .lkkkkcompetitor and member/ soloist of Kalev'sSenior Elite. Later, Toronto Dance Theatre, followed by coaching R. G. in Yukon. Leanne Cooke won Bronze as Junior at Elite Canada, "Coast-to-Coast" and the Nationals in 1989. National senior group CHAMPION in 1988. 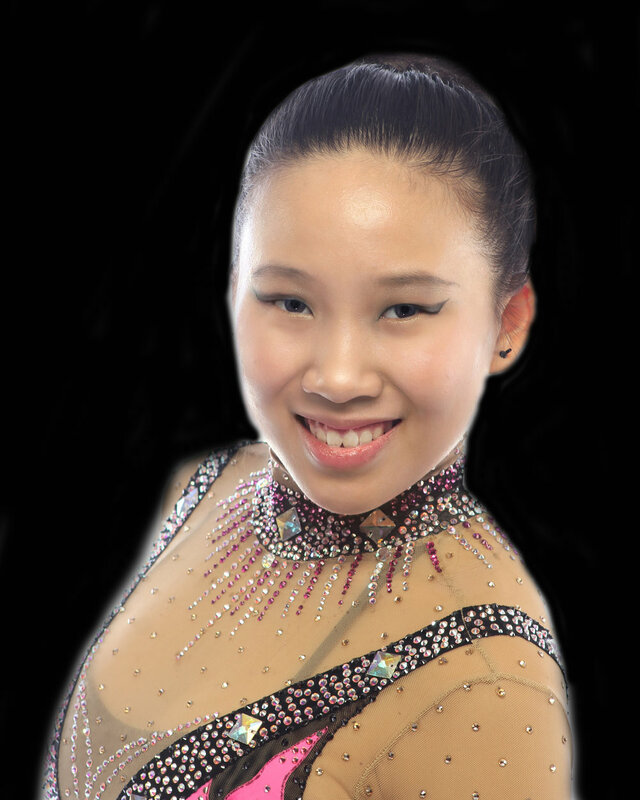 Even the most famous of all Canadian rhythmic gymnasts, Lori Fung, trained with Kalev at an early stage of her career. Evelyn Koop worked hard to introduce RSG as an Olympic sport and brought her Kalev girls to demonstrate the sport at the Montreal Olympics 1976. It was most fitting that it was a Canadian athlete who became the first Olympic CHAMPION in Rhythmic Gymnastics! Lori later founded Club Elite Rhythmic club in Vancouver B.C. Adrianne Dunnett was a Group National CHAMPION 1978, and a Canadian in 1984. Marta Bobo was from Spain, coached by Ivanka Tchakarova, 6th in the world and competing for Spain at the 1984 Olympics. From 1985, she coached for Kalev for five years, and also performed with the Senior Elite - soloist at the opening of the "Skydome". Now owner of her own club in Spain and working on her doctorate. Her email is marbo@udc.es. Monica Eder was a member of the National Team 1980-84, and later of the Senior Elite and the Alumnae Elite Performance groups. Leanne Cinits was a member of Canadian Team at the Worlds 1977 and 79, and Group CHAMPION at Four Continents in '78. Now Head Coach of Adagio Maple Ridge Club in B.C. Kati Tihane was a Provincial CHAMPION, National Team Member, 1980-83, soloist and member of the Senior Elite. Later coach for Kalev and a member of the Alumnae Elite. Jana Lazor was a Senior National CHAMPION 1978, 1979 and 1980, 29th at the Worlds 1979, 37th in 1981. Shirley Lehtinen was a Junior National CHAMPION in 1972, Senior National champion 1974 and 1976, 38th at the Worlds '73, 13th in '75 and 15th in '77. Denise Fujiwara was a Senior NationalCHAMPION 1973, 35th at the Worlds 1973, shared 14th in 1975.